We welcome you to Patmos Villa Sophia, a unique luxury private estate with a breathtaking view of the whole island. It is a charming and peaceful vacation destination in the Dodecanese Islands, featuring a variety of truly beautiful village settlements, scenic beaches, elegant restaurants, traditional tavernas and numerous aspiring churches and other shrines for worship and meditation. On the blessed Holy Greek Island of Patmos, where humans are thought to have settled there as far back as 2000 B.C, and Jesus’ beloved apostle St. John wrote the ultimate prophetic Book of Revelation of the Bible in 95 A.D, our family, my wife Tatyana, our two children Anthony and Alex and myself were privileged to acquire the divinely charismatic estate ofPatmos Villa Sophia in 1991. Ever since then, we strove to develop it with the ultimate respect and devotion, so that, today, we can happily present it to our beloved guests who can expect the highest standards of hospitality and personalized service, from an authentic Greek islands’ traditional and luxurious Patmos Villa, wishing them wholeheartedly to enjoy a sincere and deep vacation experience which they will cherish forever. Patmos Villa Sophia is prevailing practically alone over a uniquely advantageous ten acre plateau in the most aristocratic area of the historical island, Epsimia Bay. Featuring a private 50 square meters pool with sun terrace, the estate lies just 150 metres from Epsimia Beach and is located on the amphitheatrical center of the island providing advantageous access to all its major attractions. The monumental sight of the Cave of the Apocalypse, the popular intellectual elite and celebrity settlement of Chora, the scenic town of Skala with its port, and the picturesque and quiet fishing village of Grikos are all within a 4 kilometers radius. 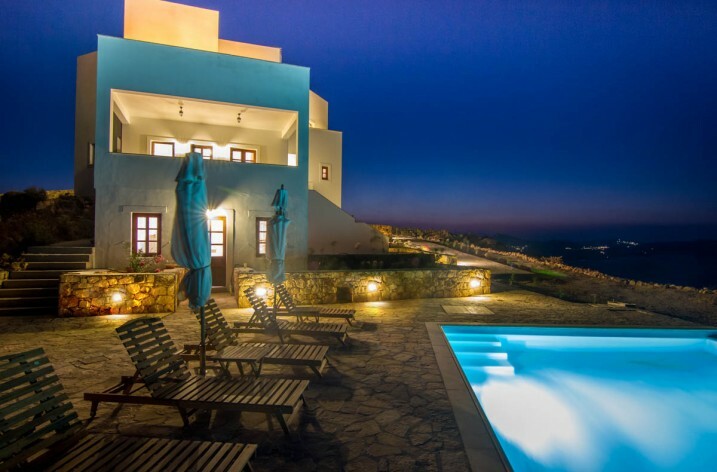 Fitted with a fireplace and traditionally decorated, this air-conditioned 272 square meters Patmos Villa comes with 4 double bedrooms and 2 extra 35 square meters rooms, all with separate entrances, private bathrooms and exclusive balconies overlooking spectacular expanses of the island. Opening to a living room balcony and a patio, it consists of a seating area with built-in sofa and satellite TV as well two kitchens with stove, spacious refrigerators, ample indoors and outdoors dining areas. Patmos Villa Sophia includes a library room with complete office facilities, PC, internet, telephone center, teleconference etc and it is a fully equipped unit including a washing machine, free parking and free WiFi available throughout. Guests may relax at the sun loungers of the sun terrace by the pool or use the BBQ facilities. 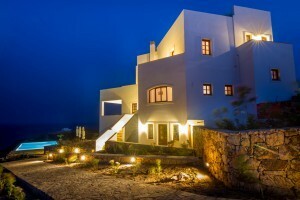 A roof garden with amazing sea views is offered and port and airport shuttle service can be provided, if requested, at a very reasonable extra charge.